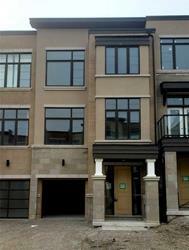 Brand-New Luxury Freehold Townhouse By Remington Homes. Spacious 3,096 Sf As Per Builder’s Plans. Extra Deep Lot With Backyard Up To 143’8′ Backing Into Green Space. 10′ Ceilings Main Floor. Frameless Glass Shower, Freestanding Tub $28,000 In Upgrades (Smooth Ceilings On Main & Upper Flr. Upgraded Kitchen Cabinets, Upgraded Hardwood Main Fl, Main & Upper Hallways, Interior Doors & Trim & More). Prime Location, Lebovic Campus, Public Transit, Schools, Park.